When we released our report on the colors of the social web, based on data analysed by our Twitter theme tool, we were surprised that blue was such a dominant color in people’s profile designs. Was Twitter’s default color influencing their design decisions? Or is blue really THE most popular and dominant color online? …We decided to look at the colors in the brands from the top 100 sites in the world to see if we could paint a more colorful picture. Turns out the blue-berry doesn’t fall far from the bush. The web landscape is dominated by a large number of blue brands… but Red occupies a large amount of space as well. What’s driving this? You might want to say that carefully organized branding research and market tests were done to choose the perfect colors to make you spend your money, but a lot of the brands that have grown to be global web powerhouses, started as small web start-ups… and while large corporate giants with branding departments spend quite a lot on market research, user testing, branding, etc. Lots of the sites listed above got started with brands created by the founders themselves with little to no research into the impact their color choice would have. I once asked Mark Zuckerberg, the founder of Facebook why he chose blue for his site design… “I’m color blind, it’s the only color I can see.” …and now 500 Million people around the world stare at a mostly blue website for hours each week. While the initial reasoning for the colors chosen may be trivial, the impact that these dominant players now have in the web world will surely influence the smaller start-ups that want to share in the positive color associations created by their bigger siblings… Once a rocketship of a web start-up takes flight, there are a number of Jr. internet astronauts hoping to emulate their success… and are inspired by their brands. And so Blue and Red will probably continue to dominate, but we can have hope for theGoWalla‘s, DailyBooth‘s and other more adventurous brands out there. Would A Corporation By Any Other Color, Still Profit As Well? Color is an important part of any brand, but along with the actual name of a company… Is it a great brand that builds a great company, or the other way around? Would Google, Google just as well with another name? My guess is yes. 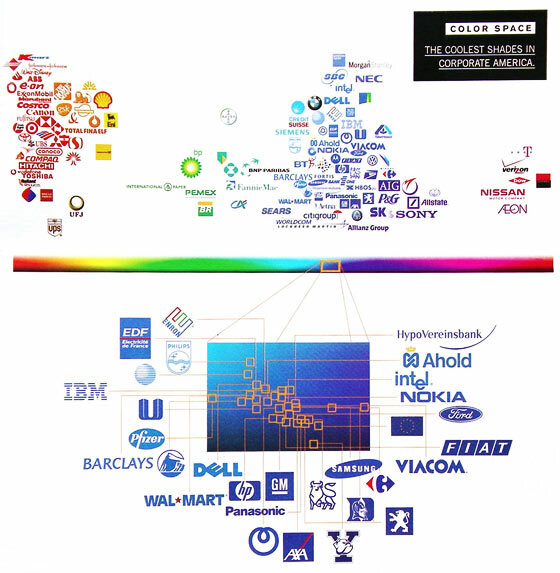 And almost 10 years ago, Wired Magazine looked at the Colors of the corporate America… Blue & Red dominate again. See if you can find the COLOURlovers icon! Uh-oh! But Will We Run Out of Color on the Web? You are the next great founder, designer, influencer or creative mind that may build the next Facebook. You have the power to influence future color trends… What colors will you choose?